Stream of SMART CUT Water Soluble Dicing Coolant added to deionized (DI) water reduces surface tension flowing from saws injection system and is carried directly of dicing blade. This reduces material thermal stress, edge damage, and internal cracking, assuring long-term integrity of material being processed. Since SMART CUT™ Dicing Coolant is a coolant and lubricant, both the dicing blade and substrate / wafer / package benefit. Stream of SMART CUT™ Dicing Coolant added to deionized (DI) water reduces material thermal stress, edge damage, and internal cracking, assuring long-term integrity of material being cut. Since SMART CUT Dicing Coolant is both coolant and lubricant, both the dicing blade and material benefit. As a coolant, SMART CUT KOOL reduces heat caused by friction. As a lubricant, SMART CUT KOOL lowers friction and surface tension, which increases swarf dispersion. Contains no nitrides, phosphates, chromates, phenols, heavy metal salts, Petroleum oils, chlorine or phosphorus. Do not add inorganic nitrates, nitrites, or organic-nitro compounds. Advanced in technology require smaller devices. As the size of devices decrease, the size of wafers overall have increased. This creates additional challenges for package and wafer manufacturers to increase production output and speed, while reducing product cost. SMART CUT water soluble coolant has been specifically formulated for this purpose. 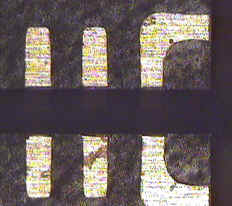 In dicing, the wafer is mounted in a frame and placed under the saw. 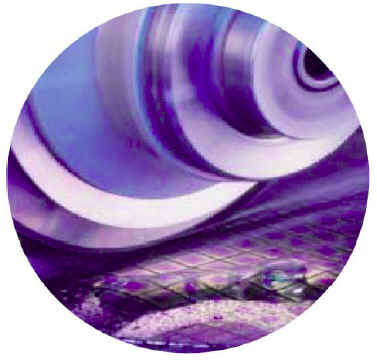 The blades rotates at 30K–60K RPM to cut a slot through the space between the die (known as a street) while using a dicing fluid/water mixture. 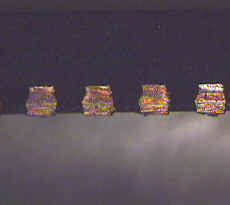 Once all the die are singulated, the frame is rinsed or cleaned and the individual die are removed for packaging. 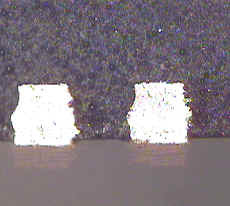 As wafers become larger and thicker, the time it takes to dice them into individual die increases. 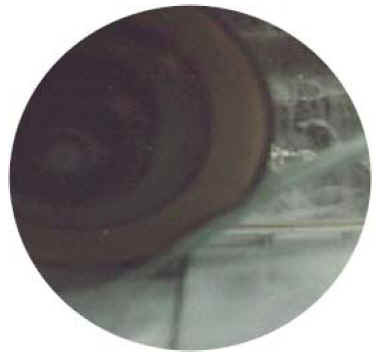 Subsequently, extended exposure to coolant during a dicing process increases the risk of corrosion and the formation of oxide, making bonding more difficult and device failure more prevalent. 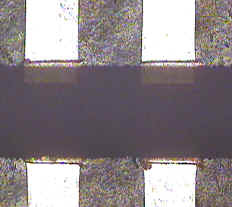 Thicker wafers and narrower streets can lead to chipping and cracking especially when using harder, thinner blades, resulting in device failure and decreased yield. Kerf material generated during dicing can stick to the bond pads making for difficult packaging/cleaning downstream. The use of a specialized dicing fluid, at economical dilution ratios of 100 parts water to one (100:1), will inhibit corrosion, keep the die clean, extend wheel life and decrease chipping and cracking for a dramatic increase in yield. Using SMART CUT™ water soluble dicing fluid also eliminates the need for a CO2 injector and protects against electrostatic discharge (ESD). Bonds Water Molecules - into the kerf and to the diamond dicing blade, allowing better swarf dispersion and lubrication. Prevent Swarf Accumulation - on the diamond dicing blade and in Back and frontside edges, minimizing chipping and internal cracking. Extend Blade Life - by up to 30%. The lubricated dicing blade runs cooler, reducing fatigue and blade wear. Eliminate Additional Material Processing . Depending on the application and your objectives, SMART CUT Dicing Coolant frequently eliminates and minimizes secondary and subsequent material processing. Improved Die Tolerances - Many of today's demanding package singulation and wafering dicing operations require very high precision tolerance. SMART CUT™ Dicing Coolant promotes attainment of close tolerances by removing heat generated at the point of contact between the dicing blade and substrate/wafer. Heat can cause deformations in both the blade and material that results in the loss of tolerance. When the generation of heat and its subsequent removal by a coolant is momentarily interrupted any coolant product will adversely affect the performance of a tool and therefore ruin a tolerance specification. Is SMART CUT Dicing Coolant a soap? No. SMART CUT Dicing Coolant was specifically designed and developed for semiconductor industry. While soaps leave residues and an cause contamination, SMART CUT Dicing Coolant rinses free, without concern of sodium's and other ingredients that may contaminate delicate circuitry. Can SMART CUT Dicing Coolant be used in a closed loop system? Yes proper filtration will not affect SMART CUT Dicing Coolant performance. How long can I store SMART CUT Dicing Coolant? SMART CUT Dicing Coolant is homogeneous mixture that will not settle during storage. Shelf life is indefinite. However as will al materials we suggest rotation your inventory. How do I use SMART CUT Dicing Coolant? A standard metering pump, commercially available can be retrofitted into the dicing saw water lines. What is the best dilution ration? Optimum dilution rates are best determined in house. Every application and customer preference is different. For best results we recommend 100:1 dilution ration. Some customers have used higher dilution ratios, with good success. What materials can SMART CUT Dicing Coolant be used with? SMART CUT Dicing Coolant is compatible with all semiconductor materials such as silicon, GaAs, Inp, or ceramic wafers. As well as majority of semiconductor packages used today such QFN and BGA, and many others. Excessive concentration of coolant is detrimental to material and waste of resources. Most internal water supplies of most organizations measure approximately seventy dynes of surface tension. When dicing and back grinding wafers and packages the dynes should be targeted for the forty five to fifty range. Coolants can only lower surface tension to a specific amount. Therefore adding more coolant concentration will only cause excessive foaming and residual build up on the wafer. Also some microelectronic packages and semiconductor wafers have copper present in the package or the photo mask operation. High concentration of coolant will react with the copper, and oxidation process can develop. General oxidation problems will arise on the bon pads. However, the proper amount of coolant as recommended by coolant manufacturer, will pose no oxidation problems. To avoid undesired die bonding problems, the sure to thoroughly rinse the water after the dicing procedure is complete. Again the use of a quality coolant will assist in wafer cleaning and removal of the slurry film build up. Additionally it is recommended to consult with the die bonding engineers to receive feedback on the consistency of their process. Sometimes the inability to standardize die bonding parameters and capillaries can be attributed to dirty wafers, specifically dirty bond pads.